Over the weekend Matt and I spent time at Sephora and Ulta looking at/trying out vegan skin care that suits him. The two brands we found at both stores that suited his manly cruelty free needs are Anthony Logistics (the line is vegan except the lip stuff) and Jack Black (most of the line is vegan - check the site). 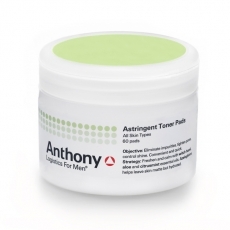 Matt's pick of the products he tried out (or had me try on him) is Anthony Logistics astringent toner pads. These are rather big pads! They remind me of the ones I used in junior high - but Matt said there is no sting involved! They left him feeling refreshed on a hot day and got off dirt that you could see on the pad! Since my birthday is next week I got the free birthday gift. I picked the guys pick which is vegan - Anthony Logistics Glycol Facial Cleanser, which can be used by us chicks to! I used it before handing it over to Matt, it left my skin feeling refreshed and the scent was nice and clean. Both brands products are in the $20 range, not bad priced for quality skin care. Sephora is so fun. Thanx for the review, I think Larry would like these, especially since they don't sting..he's a big baby.